Venture down to the shoreline in Ocean Beach and you’ll see a 65-foot Ferris wheel set up just north of the pier. 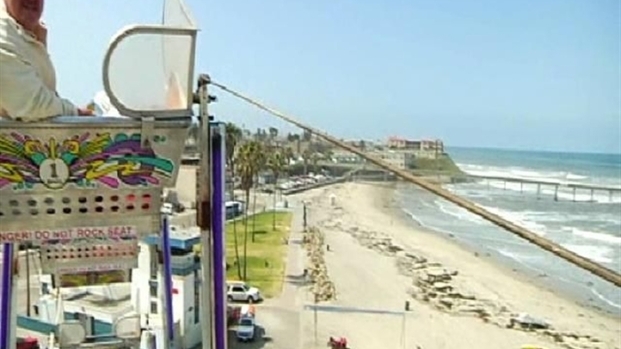 The ride is new this year, brought in for the city’s annual summer kick off event Beach Ball and according to Ocean Beach Mainstreet Association it won’t be the last. “You’ve got some great views up here,” exclaimed president Mike Akey when he hopped on the ride Thursday to give NBCSanDiego a sneak peek. The festival this Saturday includes everything from volleyball, tug-o-war, a mechanical bull and a bikini football contest. Admission is $3. 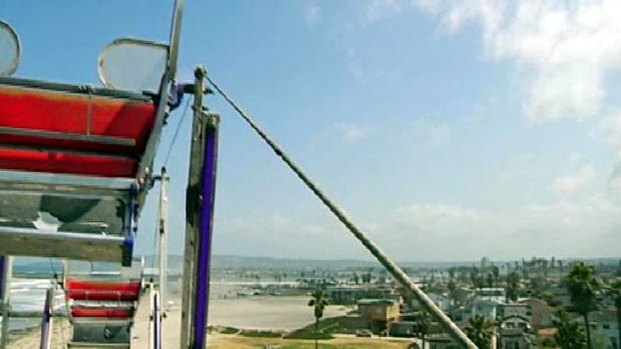 Mike Ayers, president of the Ocean Beach Mainstreet Association, gives NBCSanDiego a firsthand view of the Beach Ball Ferris Wheel just steps from the ocean. You can also enjoy the beer garden with its five bands and 15 craft brews. There will also a raffle with some Hodad’s eats up for grabs. OB Surf and Skate will be demonstrating skate and apparel, while providing free skate throughout the day. Kayak demos will be waiting on the water for aqua enthusiasts. The Ferris wheel is next to the lifeguard parking lot and will be open for rides Thursday and Friday noon to 10 p.m., Saturday 11 a.m. to 10 p.m. and Sunday 11 a.m. to 6 p.m. Tickets run $5. Take advantage of the free shuttles between the 710 Club in Pacific Beach and the main pier parking lot in Ocean Beach every 30 minutes all day Saturday.